Umarks 2 is Backup and restore Ubuntu installed packages on multiple machines, on a single machine after a clean install of Ubuntu or to restore a previous selection of packages. 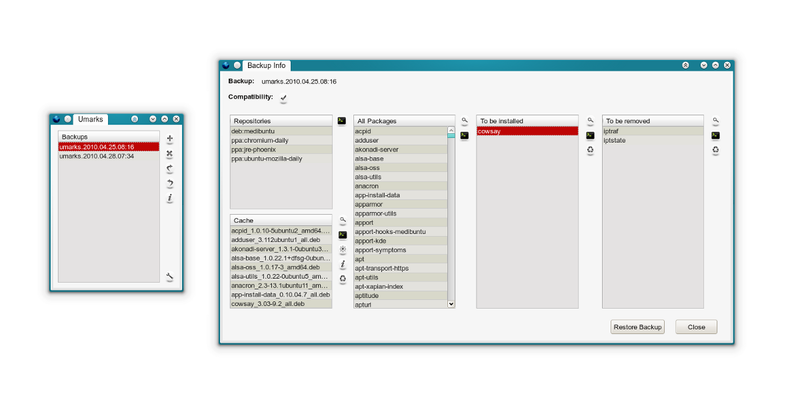 The extension allows to generate lists of installed Ubuntu packages, that you can export to your desktop, then import into another Ubuntu system running Firefox and Umarks. It can also be used as a application restoration system, since you can store multiple backups in the same machine. The extension will also get deb packages from the backup cache, if available, or download the missing ones before installing. Packages that are already installed on the target system, but weren’t installed when/where the backup was created, are automatically removed, allowing you to replicate the same collection of applications on multiple systems or restoring your favorite applications after a clean install of Ubuntu.